The paladin’s class skills are Craft (Int), Diplomacy (Cha), Handle Animal (Cha), Heal (Wis), Knowledge (nobility) (Int), Knowledge (religion) (Int), Profession (Wis), Ride (Dex), Sense Motive (Wis), and Spellcraft (Int). The power of a paladin’s aura of good (see the detect good spell) is equal to her paladin level. Does smite evil bypass the defenses of the incorporeal special quality? Smite is not an effect on the weapon, it is an effect on the paladin. The weapon still needs to be magic to harm the incorporeal creature, and even a magic weapon still only deals half damage against it. Does a paladin’s lay on hands use positive energy? Alternatively, a paladin can use this healing power to deal damage to undead creatures, dealing 1d6 points of damage for every two levels the paladin possesses. Using lay on hands in this way requires a successful melee touch attack and doesn’t provoke an attack of opportunity. Undead do not receive a saving throw against this damage. At 3rd level, a paladin is immune to all diseases, including supernatural and magical diseases, including mummy rot. At 3rd level, and every three levels thereafter, a paladin can select one mercy. Each mercy adds an effect to the paladin’s lay on hands ability. Whenever the paladin uses lay on hands to heal damage to one target, the target also receives the additional effects from all of the mercies possessed by the paladin. A mercy can remove a condition caused by a curse, disease, or poison without curing the affliction. Such conditions return after 1 hour unless the mercy actually removes the affliction that causes the condition. Diseased: The paladin’s lay on hands ability also acts as remove disease, using the paladin’s level as the caster level. Cursed: The paladin’s lay on hands ability also acts as remove curse, using the paladin’s level as the caster level. Poisoned: The paladin’s lay on hands ability also acts as neutralize poison, using the paladin’s level as the caster level. These abilities are cumulative. For example, a 12th-level paladin’s lay on hands ability heals 6d6 points of damage and might also cure Fatigued and Exhausted conditions as well as removing diseases and neutralizing poisons. Once a condition or spell effect is chosen, it can’t be changed. When a paladin reaches 4th level, she gains the supernatural ability to channel positive energy like a cleric. Using this ability consumes two uses of her lay on hands ability. A paladin uses her level as her effective cleric level when channeling positive energy. This is a Charisma-based ability. Beginning at 4th level, a paladin gains the ability to cast a small number of divine spells which are drawn from the paladin spell list. A paladin must choose and prepare her spells in advance. Upon reaching 5th level, a paladin forms a divine bond with her god. This bond can take one of two forms. Once the form is chosen, it cannot be changed. The first type of bond allows the paladin to enhance her weapon as a standard action by calling upon the aid of a celestial spirit for 1 minute per paladin level. When called, the spirit causes the weapon to shed light as a torch. At 5th level, this spirit grants the weapon a +1 enhancement bonus. For every three levels beyond 5th, the weapon gains another +1 enhancement bonus, to a maximum of +6 at 20th level. These bonuses can be added to the weapon, stacking with existing weapon bonuses to a maximum of +5, or they can be used to add any of the following weapon properties: axiomatic, brilliant energy, defending, disruption, flaming, flaming burst, holy, keen, merciful, and speed. Adding these properties consumes an amount of bonus equal to the property’s cost (see Table: Melee Weapon Special Abilities). These bonuses are added to any properties the weapon already has, but duplicate abilities do not stack. If the weapon is not magical, at least a +1 enhancement bonus must be added before any other properties can be added. The bonus and properties granted by the spirit are determined when the spirit is called and cannot be changed until the spirit is called again. The celestial spirit imparts no bonuses if the weapon is held by anyone other than the paladin but resumes giving bonuses if returned to the paladin. These bonuses apply to only one end of a double weapon. A paladin can use this ability once per day at 5th level, and one additional time per day for every four levels beyond 5th, to a total of four times per day at 17th level. The second type of bond allows a paladin to gain the service of an unusually intelligent, strong, and loyal steed to serve her in her crusade against evil. This mount is usually a heavy horse (for a Medium paladin) or a pony (for a Small paladin), although more exotic mounts, such as a boar, camel, or dog are also suitable. This mount functions as a druid’s animal companion, using the paladin’s level as her effective druid level. Bonded mounts have an Intelligence of at least 6. In addition to horses, a paladin may select (at the GM’s discretion) some less ordinary creatures. A Medium paladin can select an elkPPC:WO, giant seahorsePPC:WO, giraffePPC:WO, yakPZO1140 or zebraPZO1140 as a bonded mount. A Small paladin can select an antelopePPC:WO, capybaraPZO1140, eohippusPZO1140, giant weaselPPC:WO, ramPPC:WO, reindeerPZO1140, stagPPC:WO, or wolfdogPZO1140 as a bonded mount. The auspice, bodyguard, racer, and totem guide archetypes are all particularly appropriate for a paladin’s bonded mount. Once per day, as a full-round action, a paladin may magically call her mount to her side. This ability is the equivalent of a spell of a level equal to one-third the paladin’s level. The mount immediately appears adjacent to the paladin. A paladin can use this ability once per day at 5th level, and one additional time per day for every 4 levels thereafter, for a total of four times per day at 17th level. At 11th level, the mount gains the celestial creature simple template and becomes a magical beast for the purposes of determining which spells affect it. At 15th level, a paladin’s mount gains spell resistance equal to the paladin’s level + 11. Should the paladin’s mount die, the paladin may not summon another mount for 30 days or until she gains a paladin level, whichever comes first. During this 30-day period, the paladin takes a –1 penalty on attack and weapon damage rolls. Consult your GM if the special animal companion feats or archetypes are allowed. The archetypes are listed here followed by the feats. Although all paladins commune with divine forces and celestial spirits, some are able to do so in ways that transcend the typical martial blessing or celestial servitor. When a paladin gains the divine bond class feature, she can choose one of the following variant divine bonds instead of those outlined by her class. All variant divine bonds are supernatural abilities, and a paladin cannot choose a variant divine bond if she has an archetype that alters or replaces divine bond. At 8th level, a paladin is immune to charm spells and spell-like abilities. Each ally within 10 feet of her gains a +4 morale bonus on saving throws against charm effects. 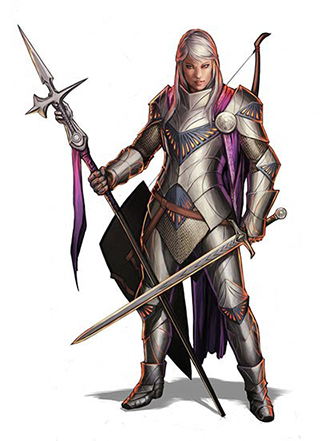 At 11th level, a paladin can expend two uses of her smite evil ability to grant the ability to smite evil to all allies within 10 feet, using her bonuses. Allies must use this smite evil ability by the start of the paladin’s next turn and the bonuses last for 1 minute. Using this ability is a free action. Evil creatures gain no benefit from this ability. At 14th level, a paladin’s weapons are treated as good-aligned for the purposes of overcoming Damage Reduction. Any attack made against an enemy within 10 feet of her is treated as good-aligned for the purposes of overcoming Damage Reduction. At 20th level, a paladin becomes a conduit for the power of her god. Her DR increases to 10/evil. Whenever she uses smite evil and successfully strikes an evil outsider, the outsider is also subject to a banishment, using her paladin level as the caster level (her weapon and holy symbol automatically count as objects that the subject hates). After the banishment effect and the damage from the attack is resolved, the smite immediately ends. In addition, whenever she channels positive energy or uses lay on hands to heal a creature, she heals the maximum possible amount. A paladin who ceases to be lawful good, who willfully commits an evil act, or who violates the code of conduct loses all paladin spells and class features (including the service of the paladin’s mount, but not weapon, armor, and shield proficiencies). She may not progress any further in levels as a paladin. She regains her abilities and advancement potential if she atones for her violations (see atonement), as appropriate. Instead of receiving an additional skill rank or hit point whenever they gain a level in a favored class, some races have the option of choosing from a number of other bonuses, depending upon their favored classes. The following options are available to the listed race who have paladin as their favored class, and unless otherwise stated, the bonus applies each time you select the listed favored class reward. Holy warriors and defenders of the faith, paladins know that the only thing more abhorrent than an evil creature is a fundamentally good creature too timid to strive against the forces of darkness. Paladins are divine champions, gladly giving their lives in the service of light and justice, asking only that they may protect the innocent and cleanse the world to the best of their ability. Theirs is a hard path, requiring great sacrifice and ultimate devotion to a moral code, yet with her last breath a paladin can take comfort in a life of absolute righteousness. Presented below are several variant class features to help flesh out common paladin Archetypes, the better to customize characters for fighting the good fight.